A Manipuri special mild curry prepared with soy chunks, potatoes, and green peas. This milk-based gravy requires only minimal spices and goes well with rice, roti, and poori. If using frozen peas, thaw 1/3 cup of the peas or soak them in water to bring it to room temperature. Soak the soya chunks in water for 15 minutes and drain the water. Also, squeeze the soya chunks and remove the excess water. Cut the potato into cubes and soak it water to prevent it from turning black. Slit the green chilies into two. Once the oil is hot, add the cumin seeds and slit green chilies and fry for a minute. Then add the ginger garlic paste and cook for a couple of minutes. At this stage add the chopped onion and cook until they turn translucent. 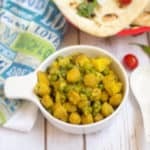 Then add the soya chunks, diced potato and peas, followed by turmeric powder and salt. Mix them and add a half cup of water. Now set the IP in the steam mode with the vent in open position. Once the pressure is build up, Let it cook for 2 minutes and turn the IP off. Let the pressure release quickly. Carefully open the IP and set it back to sauté mode and stir the ingredients nicely. Finally, add ½ cup of milk, 1/2 tsp of garam masala and 2 tbsps of chopped cilantro and let it simmer for 2 minutes. That’s it. Soya Thongba is ready. Serve it hot with rice or roti. Now cover and cook for 5 to 7 minutes or until the potatoes are soft and tender. Make sure the potatoes are not mashed up. You can skip adding water and cook this entire curry in milk or make it richer you can use ½ cup milk and ½ cup cream too. I used red potatoes, and I did not peel the skin. But you can use any variety and based on your preference you can peel the skin or leave as is. Garam masala is completely optional.